I saw this on Twitchy and it explains everything. First, let me introduce you to Stephanie Kelton. 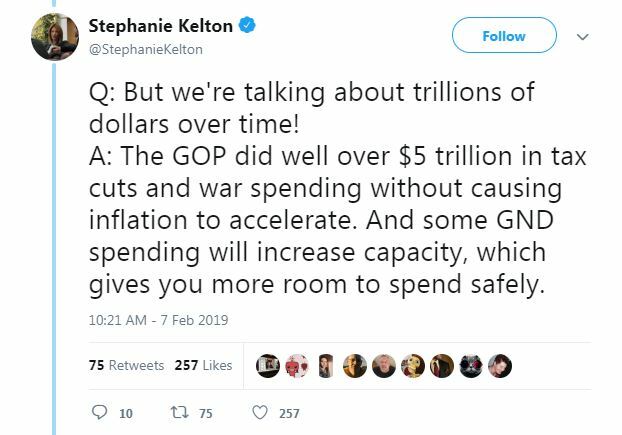 She is a Professor of Economics & Public Policy at Stony Brook University, and was Chief Economist for the Democrats on the U.S. Senate Budget Committee. Here is the Tweet that started it all. I highly recommend you read the whole thread before it gets taken down. 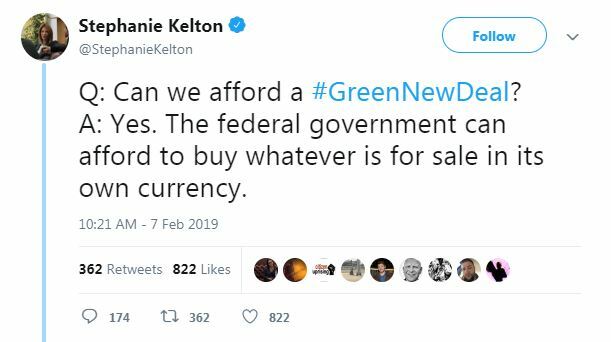 So what is in the Green New Deal that the government can just buy with it’s own currency. 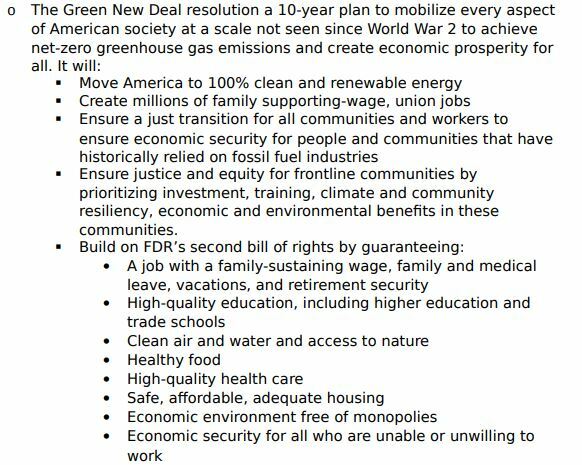 Here are some excerpts from Congresswoman Ocasio-Cortez’s Green New Deal launch memo. Quality health care, affordable housing, and economic security for all who are unwilling to work. So right out of the gate the US government is going to take care of everyone who decides never to go back to work because they are going to get taken care of by the government. I’d say… at least half of the 160 Million US workforce, and their dependents, would quit overnight if this happened. Also known as rolling blackouts and power bills that dwarf your mortgage payment. Cattle cars for the proles whole the Eco-Nomenklatura get to drive the electric version of the Trabant. At which point the Great Green Leap Forward causes famine. So what we are going to get is a totally destroyed economy with mass starvation and death. That sounds like something definitely worth paying for. Let’s get more details from Professor Kelton on how exactly were going to do that. So yes… we’re going to print money to pay for this. 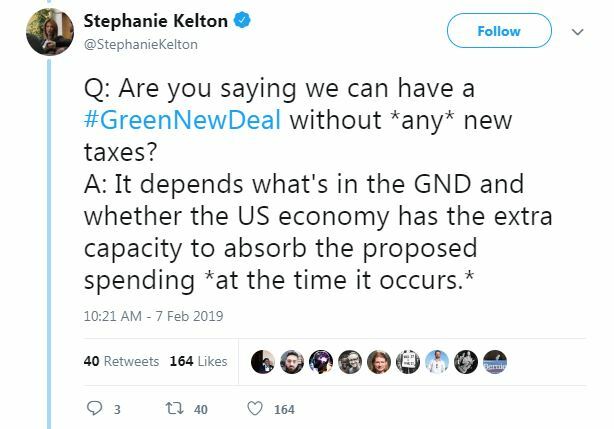 I’m going to skip over some tweets where she explains why using tax money or raising the national debt to pay for the Green New Deal is a bad idea. 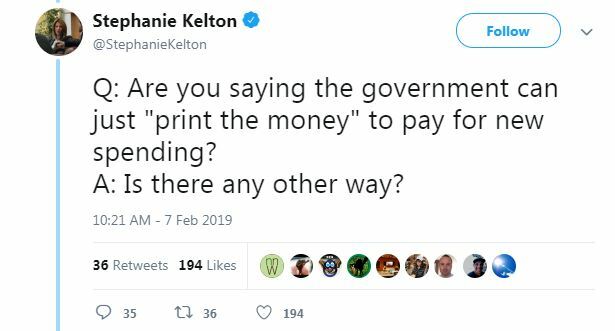 Professor Kelton want’s to print money to pay for a program that will blight agriculture, destroy manufacturing, put millions of Americans out of work by eliminating the energy, mining, fossil fuels, plastics, automotive, trucking, and aviation industries, and then incentivise everybody else to not be willing to work and live off the government dime. You know what this is going to do? I wonder if Professor Kelton can spell Hyperinflation. By the time we’re done, the exchange rate is going to be a trillion dollars to the Bolivar. That a woman who could advocate for a policy that failed in Weimar Germany, Zimbabwe, and Venezuela was the economics expert for the Senate Democrats now makes everything make sense. 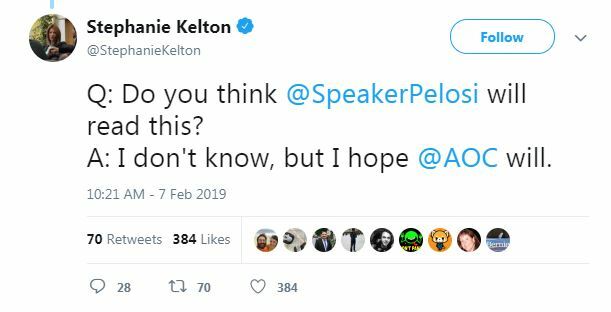 Of course she will, and she will retweet it as proof that the Green New Deal will work perfectly. I posted this once before as a joke. 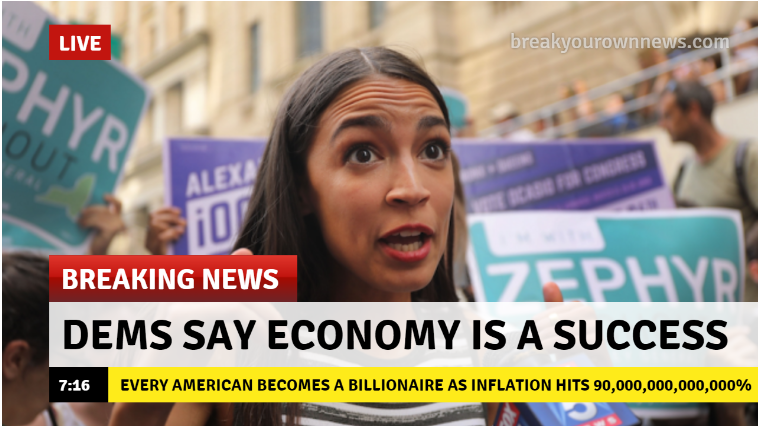 Now I I think that once the Green New Deal is put into place, it should be Alexandria Ocasio-Cortez’s face on the 100 Quadrillion dollar bill. Now that Kamala Harris backs the Green New Deal, if she gets elected in 2020, I’m going to liquidate my assets and use the money to buy ammo. I don’t need to pay for a house if the government is going to give me one. I will need the ammo to hunt for food and fight off the roving mobs of those unwilling to work, who come to eat my dogs because the bread line ran out of gluten free avocado toast after the third person. The Socialist Dream Utopia will certainly make everyone equal. Lying in the mud, or buried underneath it. And the only way to force our carbon footprint back to pre-industrial levels to to completely wipe out industry. All of these aren’t bugs, they’re features. And the Socialists’ know it. It’s always telling to see the word “worker” in one of those screeds. That’s a standard part of communist jargon. It means “the people we pretend to care about, who will from now on obey orders or starve (or possibly both)”. While the noble leaders that sacrifice and are forced to use their time to lead the masses will humbly accept the necessary gifts from the people of their chauffeur driven vehicles, massive personal staffs, and private dachas. The good news is that their children will learn at their knee, and continue their parents public service, just like the Kims in NK. America is being “led” by lunatics. WTF. My freakin head is gonna go boom! Think all us Patriots could move to like Texas and have our own gun loving freedom lovin “safe space”??? Man, this won’t happen for one simple reason. Our current infrastructure isn’t this complete, and we’ve had 2 centuries to do it. You think the current system is going to be uprooted and replaced by an even bigger system in a decade? Nah. This list reads like an Onion article or a 10 year old’s wish for the future. It just… can’t… happen. We literally are incapable of pulling this off even if we tried. These ‘adults’ share more in common w/ that hypothetical 10 year old than they do with reality. Unless of course they know it’s a full load and are trying some backdoor feudalism (heh) with us. What the twit is spewing, excuse me, what the “Professor of Economics & Public Policy at Stony Brook University, and was Chief Economist for the Democrats on the U.S. Senate Budget Committee.” is spewing is the latest con job from leftist professors called Modern Monetary Theory and it’s being sold as this latest theory that says what they want it to say. What she’s saying is literally that if you took a Sharpie and added six zeroes to a $20 bill in your wallet, it would be worth $20 Million. Except it has to have the magic fairy dust of gubmint on it to really be worth $20 Million. A ten year plan MUST be twice as good as a five year plan! I’m starting to suspect that she’s a troll, sending up the various stupidities of the Democrats, Socialist, and clueless millennials. She’s making them all look bad. Then again, Poe’s Law still applies. While I agree with the basic premise the monetary system is joke and made up, you can only take a joke so far before it starts to not work and what this woman is sufgessugg would be beating the punchline like a dead horse. Love how “access to clean air, water, and nature” is part of the deal. If you call a dark patch of dirt underneath a solar panel “nature”, then sure. Yeah, that new house you’re hoping for will be a beautiful, 20’x20′ 33rd floor one room barrio. Lookin’ forward to that! We simply need to capture more unicorns to run on treadmills for a power source and tax the Tooth Fairy for the funds to pay everyone to not work. See…utopia. Previous PostPrevious Why we do not believe the Press: NYT uses the “Not real Socialism” excuse fact-checking the President. Next PostNext Florida: They are back!